During the past season (2014), Namib vultures have set a new breeding record. The Lappet-faced vultures that breed over most of Namibia have their stronghold in the Namib-Naukluft Park. This year the Lappets in the Park raised 100 chicks. 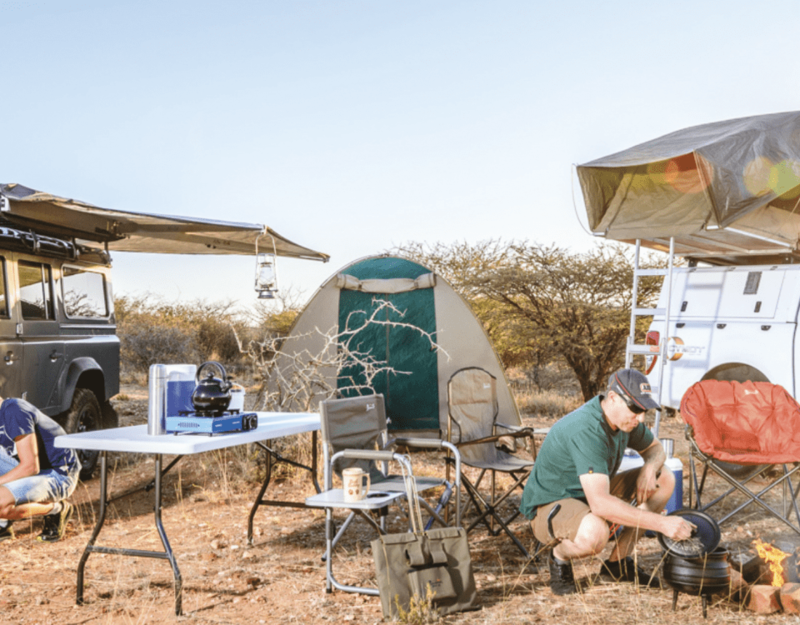 The main breeding area, between the Swakop and Kuiseb Rivers accounted for the most nests, but further south, from the Kuiseb River to Sossusvlei, breeding was higher than expected. The breeding success of these large vultures has been monitored for the past 24 years and it is the first time that 100 chicks have been found and ringed. The 100th chick was ringed in the Tsauchab River, leading to Sossusvlei. Volunteers from Vultures Namibia, who have been monitoring and ringing the chicks in their nests, are delighted at the higher than normal number of birds found and ringed. Mark Boorman, one of the many volunteers that made it possible, commented: “It was worth all the hard work”. The previous record was 89 chicks ringed in 2007. 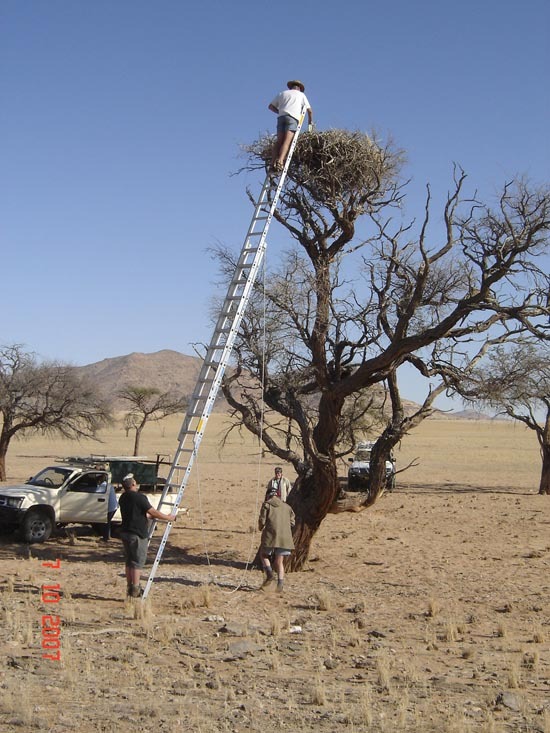 The monitoring of breeding Lappet-faced Vultures in the Namib-Naukluft Park started in 1991 and this long-time project has notched up some interesting records. It is the longest running project of its kind in Namibia and the first to record two vulture chicks in one nest. Vultures normally only lay one egg, but in 1994, two chicks successfully fledged from a nest in the Tsondab River. Then in 2012, Holger Kolberg found another nest with two chicks near Mirabib. The success of the past breeding season is probably due to a number of factors. The first is the excellent aerial survey carried out to locate the nesting vultures from the air and secondly, the increased breeding is likely due to dry conditions and an abundant supply of food. The past few years of good rains in the Namib-Naukluft Park resulted in increased breeding of gemsbok, springbok, Hartmann’s mountain zebra and ostrich. Now the limited grazing in several areas could be to the advantage of the vultures as the drought takes its toll. In early October, the aerial survey took place over the known breeding area of these large birds. As the vultures nest on the top of trees, the nests and chicks are visible to slow, low flying aircraft. Even eggs are visible and the position recorded on a GPS. The aerial survey, by pilots Peter and Harald Keil, conducted over two days, was the best survey for many years. The record number of occupied nests found is due to the flying skills of these two pilots and the experienced observers. Thanks to the Westair Group for the use of their aircraft and pilots at no cost to Vultures Namibia. Donations for fuel came from other sponsors. After the aerial survey, many volunteers spent several days driving from one marked nest to the other. A long ladder enables the volunteers to reach the nest and a numbered metal ring is fitted around one leg of the bird. In addition, attached to one wing, is a numbered plastic cattle ear tag. Both these are used to monitor movement once the bird leaves its nest. 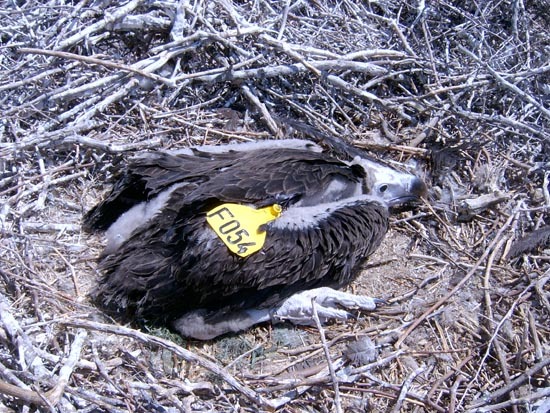 The tag is visible from a distance and the number distinguished using binoculars or a telescope. Camera-traps at waterholes and vulture restaurants record an increasing number of marked birds. Triggered by movement, these cameras result in many, positive identification of marked birds. Although many vultures breed in protected areas, they feed on farms and fly to neighbouring countries. Here landowners, who use poison to control predators attacking their domestic stock, can poison the vultures. Even game farmers use poison to kill predators of springbok lambs and high-value roan and sable antelope calves. Other dangers are drowning in steep-sided water reservoirs, collisions with power lines, electrocutions on electricity pylons and use in traditional medicine. Mass poisoning at elephant carcasses is a new threat to vultures. The poachers poison the elephant carcass after removing the tusks to stop vultures betraying the slaughter of these animals. The vultures are ‘eyes-in-the-sky’ and alert police and conservation officials. This alarming trend has killed many hundreds of vultures in Namibia, South Africa, Botswana, Zimbabwe and East Africa. It is encouraging that vultures in the Namib-Naukluft Park have had an excellent breeding season. The sponsors and volunteers are thanked for their assistance. Anyone seeing marked vultures can report their observations to Vultures Namibia at 081 260 7375 or 081 129 5163 with the location, date and tag or ring number.